Our class read just a couple of her picture books (and since then I’ve found out she has written over 25 others! ), and found that we really enjoyed her writing voice, as well as Sarah Klise’s (her sister is her illustrator) pictures. We tried out Shall I Knit You a Hat? and Little Rabbit and the Meanest Mother of Earth, and when she was here she read us Grammy Lamby and the Secret Handshake. Once she got here, we were all abuzz, excited to hear what she would tell us about herself and teach us about writing. 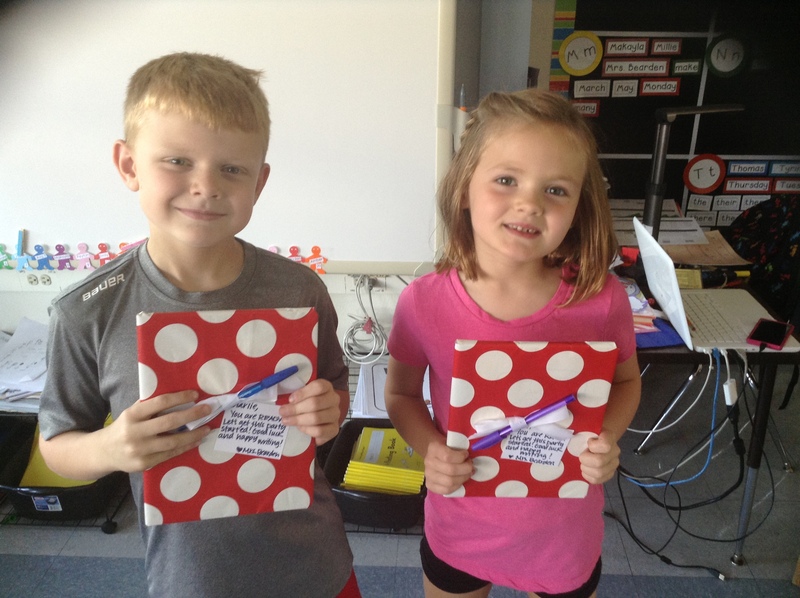 A couple of friends took their Writers’ Notebooks to be sure to catch Ms. Klise’s smart words. Basically, her presentation was a workshop where she taught us (2nd and 3rd grades) the necessary elements for writing a good story. She told funny stories, made us laugh, and most importantly got us involved in the show. We hung on her every word! Main Character, Problem, Journey, OH NO!, and an Aha! And, because authors are rockstars in our world, we had to take a minute for a photo opp! Thanks SO MUCH, Kate Klise, for taking time out to spend the morning with 2nd graders who are working to grow as writers and share their stories with the world! Elementary school is an interesting thing. Because of the way that school has been structured for years and years, we teach and learn all the subjects together in one day, yet each one is compartmentalized into it’s only little spot in the schedule. Well that’s how it’s traditionally done, but I try my hardest to help my kiddos see that “writing” is not just something we do from 10:30 to 11:15 every day, just like “reading” doesn’t only happen from 9:00-10:30. These are just things that we do as learners and they are ways we learn and show our learning. 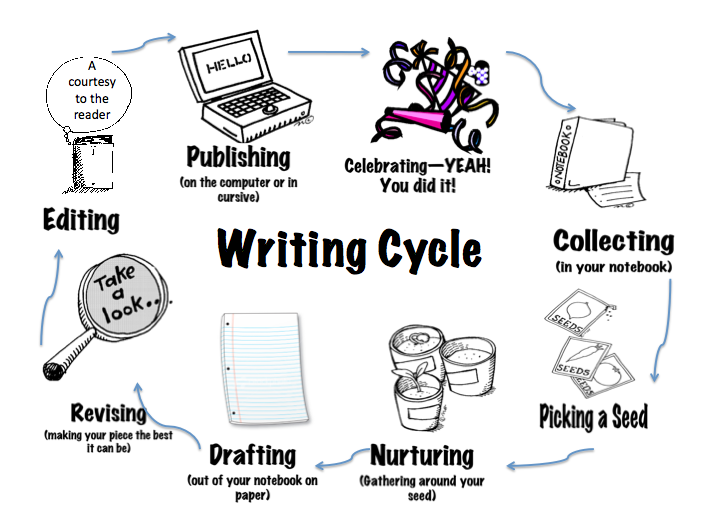 That being said…we do have specific things that we do as writers on most school days. One of those is write. During Writers’ Workshop. (I know, I told you it was interesting). I wanted to share two things that we’ve done lately that help show our growth as writers over time. First of all was a writing challenge. I love how when I told my kiddos that we were going to have a writing challenge they pretty much all cheered. I don’t know if it was the “writing” part or the “challenge” part, but either way I was pleased. The challenge was to take a piece of writing they had done at the being of our last writing cycle (Small Moments) and work to improve it to show the things they had learned over the last few weeks that they didn’t know before. They would revise and edit their piece and then publish a final draft. They worked with a writing partner (which is also something we typically do as writers in our room) to help make sure they didn’t miss anything. They sure worked hard and their final pieces turned out pretty great! Secondly, remember how I shared that everybody has their “big” notebook now? It means I finally got to share the lesson about how to take all those super smart entries they wrote while they were learning about Writers’ Notebooks and save some of them. Basically they had to ask reread the entries in their tiny notebooks, and then ask themselves if they were: 1) important, 2) something that showed what they can do as a writer, 3) something they could use in the future, or 4) something they wanted to remember. If the answer was YES to any or all of those, then they taped it into their big notebook to save for later. It was great to see their reflecting and thinking as they evaluated their writing over the last few months. Great stuff happening there, too! And EVERYBODY has a notebook! It’s been a long time coming, and every writer in our class has done an amazing job of working hard to prove they are ready. I am super excited at how excited they are about learning to be better writers by WRITING EVERY DAY!! If you know a friend from Rm. 202, please tell them how proud you are of their hard work and grit!! 3 Writing Celebrations in 1 Day!! We have been working through the writing process, using seeds we’ve put in our Writers’ Notebooks. Once we got to the end (which took WAY longer than I remembered it would! ), we were ready to CELEBRATE with our friends! The best part about what we did was that we did it with more than one class! Mrs. Appelbaum’s class was finished with their pieces, too, so we got together. There was also a comment sheet she had come up with, where readers would give the writer feedback based on these starters: “Something I liked about your writing was…”; “Something I learned was…” and “Something I wonder now is….” I’ve done compliment sheets before, but they’ve always been completely open-ended. The structure of her sheet was helpful for those that needed ideas, but was also still open-ended enough for kids to make choices on how they’d respond. From within minutes of when we started, the room was “a-buzz” with that fabulous sound of excitement, learning, and laughing as kiddos proudly shared the work they had done to create meaningful writing pieces. While you can’t really get the same experience from seeing pictures of it as if you were there, I do think you can imagine the experience. Sometimes just seeing the pride and happiness on their faces is story enough! Ok, these next few will look really similar, but they’re from the 2nd go-round, where Mrs. Appelbaum’s friends came to hear our writing. We were excited to try out her “rules” and the compliment sheet on our work! Jamiir leaves a compliment for Ja’Mia. Thomas was excited about hearing Millie’s piece about the olden days. Mrs. Appelbaum even joined in and listened to Jacob read his story called Mr. Zap. Amber shared her non-fiction writing with Solis. Tre’ listened to Baron read his non-fiction writing about his trip to Alaska. Emily shared her story with Noah. Khalani read his piece about a trip to Branson to Thomas. Jamiir writes a thoughtful comment for Sara as she waits patiently. Evan and J.D. discuss writing. Mya and Ella Marie listen to EM’s story about Zelda and witch school. Ava and Antoine work together. Alexander comments on Nate’s writing piece about when Pacifique and Tresor came to visit Robinson. Tyrin and Anthony listen respectfully. Kaden comments on Amelia’s writing piece about her friend. I don’t have pictures of the last share we did, but after we had practiced with the Appelbaum team, we invited our friends from Ms. Turken’s class (they’re first graders) to listen to our writing, too. 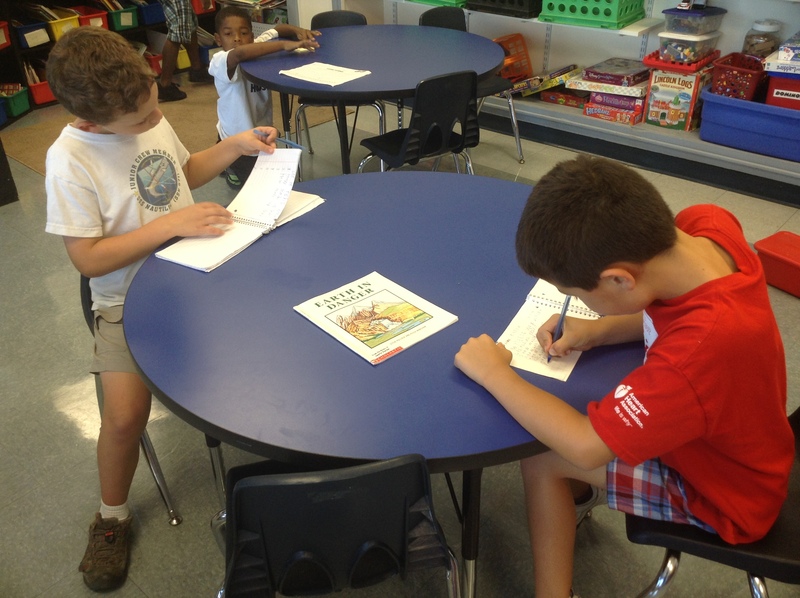 This was the first time they had been to a writing celebration and we were hoping to teach them well about how it was supposed to work. You’d never have known they were newbies–they were writing rockstars and worked really hard to give us meaningful comments on our work! Hopefully we can share with them again when they’re finished their own writing pieces. Whew! What an exciting day of celebrating our hard work, our meaningful writing ideas and our using grit and perseverance to share great stories! Way to go, Rm. 202 kids! Tiny Notebooks: Notebook Day is HERE! If you haven’t read the first part of this story, check it out here. And so after this conversation, I explained the way my friends had made my head hurt (in that good way! ), and how I wasn’t sure what to do. We agreed that it made TOTAL sense that kids would get their notebooks at all different times and they were TOTALLY good with it. They knew that they were in charge of when they were ready and that they simply had to PROVE to me that they were ready. Challenge accepted. And these smiling faces were the first round of Rm. 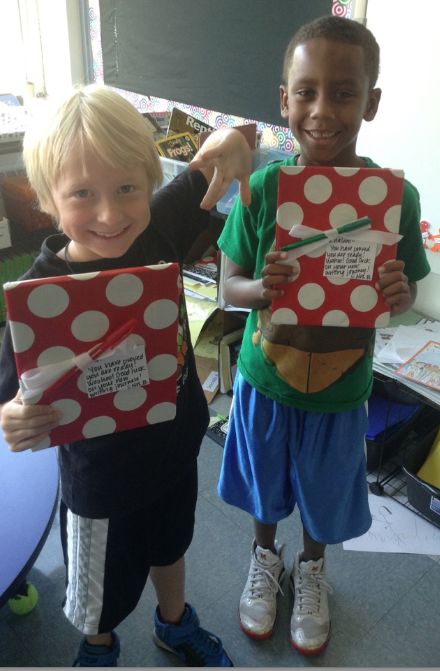 202 friends who were ready for their REAL notebooks! Yippee! The excitement that then filled the room was contagious! 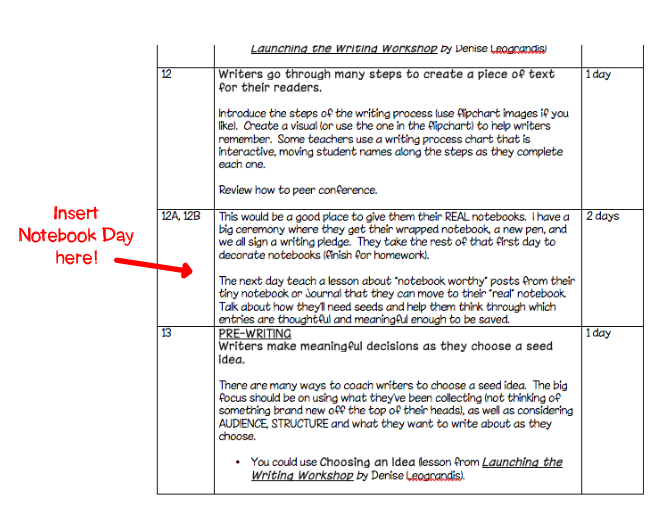 So…you know we’ve been doing work with tiny notebooks as a way to introduce Writer’s Workshop this year. Well, eventually there comes a time when our 2nd grade writers will prove to to us that they are ready to graduate into their “real” Writer’s Notebooks. As a matter of habit, I guess, I put that step into the plan right around Day 12, when I figured that everyone would be ready; I’ve always done it that way with everyone on the same day (like here, and here). I proceeded normally, working a few days ahead of my team, which was nice so I could work out the kinks of the plan (I’d used this idea with older kids, but never with 2nd graders, so I wasn’t quite sure how it would work! LOL). Then one day, at a working lunch, the subject of notebooks came up again. Everyone wanted to know how I had decided to actually handle it, and what procedure I was going through to get them to my kiddos. I mentioned that I was going to plan Notebook Day for the following week, with everyone celebrating on the same day (which is again, the way I’ve always done it). The next thing that happened was really interesting. Most of my friends around the table just said, “Hmm….” and I could tell they were trying to work it out. They asked me about the purpose of teh tiny notebooks and how it didn’t make sense to do everyone’s Notebook Day on the same day if everyone was ready at different times. 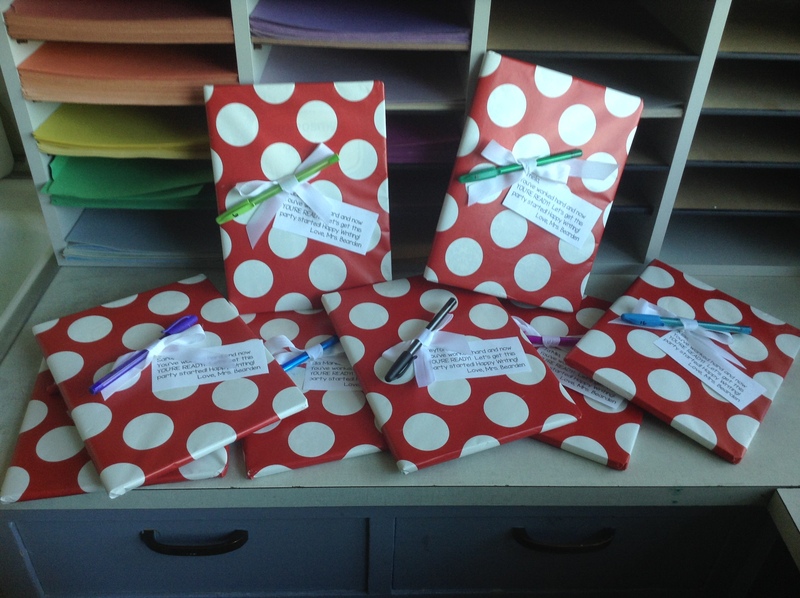 They were, after all, supposed to PROVE to me that they “got it.” I explained that the real thing behind the tiny notebooks was, in addition to teaching them how to use their “real” notebook, the expectation and anticipation of getting their new notebooks. I rationalized that I’d always gotten everyone on board in a really positive way and that maybe it didn’t really matter if they were ready; Notebook Day was more about the ceremony and excitement around being a writer. We agreed that probably everyone else was going to give individual kids their notebooks when they were ready, rather than all at once, and that I was probably going to go ahead with an all-class celebration. Most importantly, though, we agreed that there was no RIGHT way to do it. Personal choice and professional judgment was paramount here. Well, the meeting ended and I went on with the rest of my day, but I COULD NOT get that conversation out of my head. I had a headache in a really good way. You know those kind? The ones when you know that you’re chewing on something really important and you’re actually ok that it hurts? (You don’t have those? I hope so, because it means that you’re surrounding yourself with really great people who challenge you to improve your practice and evaluate how you do things. 🙂 ). I finished out the day, still unsure how I would proceed, and went home to have the same conversation with Mr. Bearden. I was pretty sure that (while it wasn’t a right/wrong issue) he would side with me, agreeing that a whole-class Notebook Day was a great idea. Well…he didn’t. He was actually really great about asking many other questions about it, and making suggestions about how I could have better explained my thinking to my team. He sided agreed that my team’s thinking that “when you’re ready” is the best time for new notebooks. I chewed and chewed, trying to figure out why I’d always done it that way, and whether or not it would (or should!) work for this particular group of kiddos. Why hadn’t I ever done it “when they were ready,” as I had always explained to my students it would be? Why had I always done notebooks as a one-size-fits-all type situation? Well, ok, honestly probably because it’s easier. Especially with bigger kids, I probably didn’t want to manage keeping track of who had their notebook and who didn’t, as well as not wanting students to feel like they weren’t good enough or good writers. The whole thing, after all, was based on helping kids see themselves as writers, learn to live like writers and WANT TO BE WRITERS. In my mind, any negative (or something they could perceive as negative) was a no-go. But maybe a one-size-fits-all what this group needed. Maybe, since they’re younger writers and this is the very beginning of their lifelong journey as writers, this was the year that I changed my whole process and really did what I said I was about all along (novel idea, right?)? And really, now that I admit it, when does one-size-fits-all ever work for kids? So I decided I’d jump in and change up the whole “real” notebook deal this time around. There are pieces of it that I knew I wanted to keep the same, but the “when” of the process would be different for this new group of kiddos. And you know what? It’s been totally great and then some. Better than I could have imagined, and the anticipation and excitement are actually increased since kiddos aren’t sure when their Notebook Day will come. Ok, so as I got to #3 on the list of places where writers get their ideas, I figured I should write the story in 2 parts. 4.) Heart Maps: This strategy has to do with how writers can sketch pictures to give them ideas, as well as how thinking about what’s in your heart (things that are important to you!) can help give you ideas. 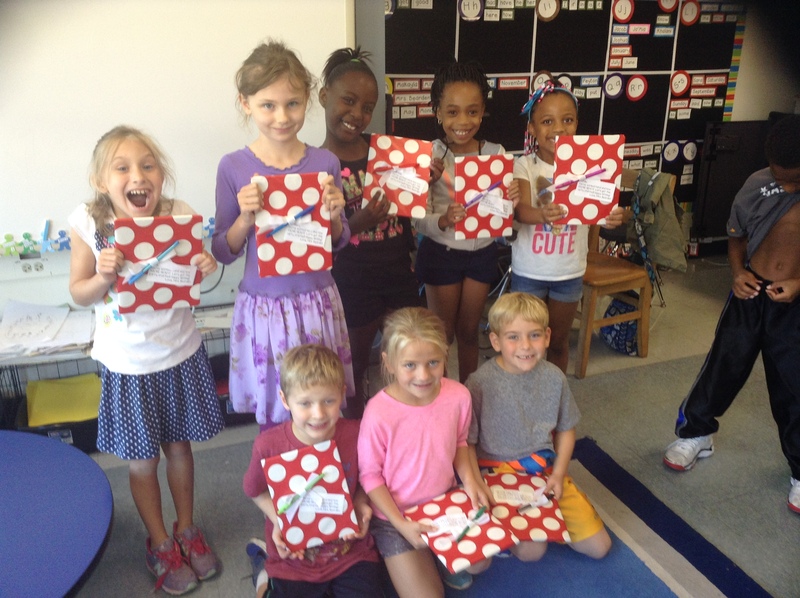 These hearts are added to kiddos’ “real” notebooks as they get them. They can be added to and changed as kiddos change, but here they are for now. Look at all of those ideas waiting to be written about! 5. Books and Each Other: While this was not officially one I put on the list this time, it came up in our conversations and we couldn’t let it go. Often you get ideas just from hearing what your friend is writing about! We are learning how to have meaningful conversations with other writers. 6. Lists: This one is so easy! I shared lists in my notebook that I have written of characters, ideas for settings (really it’s places I saw on signs while I drove to Nashville), smells I like, smells I hate, lists of lists, lists of ideas for things I can write about in the future. The possibilities are ENDLESS here! 7. Senses: Sound: For the example of this one, I shared an entry I had written in my notebook one day while I was at the pool. Back in 2005 before I had kids and could actually RELAX when I went there (LOL, love you Riley and Allie! ), I used to read and write in my notebook. One day I heard the sounds of two birds in a bush next to me and imagined their chirps and coos as a conversation. When we tried this one, we were able to go outside and enjoy the beauty of the new and improved Robinson Naturescape as we listened for interesting sounds and described them with our words. Our first time in the Robinson Naturescape for this year! 8. Senses: Sight: I had another one in my notebook that I entitled “Santa in St. Croix,” where I described a guy with who looked like I imagined Santa would look like if he was on vacation. I wrote about his “bowl of jelly belly” and how he was wearing tiny red shorts and black flip-flops instead of a red suit and boots. I also read an entry describing clouds on a sunny morning and shoes I was wearing. We ventured outside again, hoping to find something beautiful and inspiring in our backyard woods. 9. Fierce Wonderings: This is perhaps the one that is most transferable to other areas of learning. Once we get kids wondering (which is really pretty easy), and then recording their wonderings (which for us was a little trickier), we can start to DO something with those wonderings. it could be starting a research project, helping a kiddo find just the right book based on their interests, getting kids to imagine and create possibilities based on the unknown, or even a genius hour project. We have them in our notebooks and on our Wonder Wall. We’re hoping to do great things with them, and continue to wonder about the world around us!